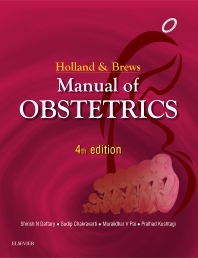 This book is based on the classic ‘Holland and Brews Manual of Obstetrics’. The fourth edition is comprehensive with clear concepts, concrete up-to-date knowledge and student friendly "one stop obstetrics textbook". Basic principles, investigations, management options as well as the recent advances have all been explained in a simple and systematic manner. The information given is evidence based and as per international guidelines and management protocols. Dr Prahlad Khustagi is working as Professor in Obstetrics-Gynecology, Kasturba Medical College, Mangalore, A constituent unit of Manipal University. He has set up Academic Departments in University Medical Colleges in Nepal and Saudi Arabia; Clinical - Academic Units of Obstetrics-Gynecology at the Udupi Campus of Kasturba Medical College in India; Al Ahsa of King Faisal University in Saudi Arabia; Urogynecology Services at University Teaching Hospital in Al-Ahsa, Saudi Arabia.